WASHINGTON, DC – As the one-year anniversary of the Harvey Weinstein sexual assault and harassment allegations approaches, the bipartisan Congressional Caucus for Women’s Issues hosted a hearing about sexual harassment entitled, “#MeToo, What’s Next? Turning a Movement into Action.” Caucus members heard from leaders from a number of industries to discuss ways to promote respect and dignity in the workplace, and ultimately to find innovative and creative solutions to the problem of workplace harassment. The hearing was hosted by Reps. Susan Brooks (R-IN), Co-Chair of the Congressional Caucus for Women’s Issues, Lois Frankel (D-FL), Co-Chair of the Congressional Caucus for Women’s Issues, Brenda Lawrence (D-MI), Vice Chair of the Congressional Caucus for Women’s Issues, Mimi Walters (R-CA), Vice Chair of the Congressional Caucus for Women’s Issues, Barbara Comstock (R-VA) and Jackie Speier (D-CA). Thank you for this opportunity to address the Congressional Caucus for Women’s Issues on behalf of the Fair Food Program. Over half a million women work on farms in the U.S., growing and harvesting the food we eat. The overwhelming majority of them – up to 80 percent – suffer pervasive sexual harassment, and/or sexual violence in the workplace. Since 2011, however, through the FFP, this reality is being transformed. 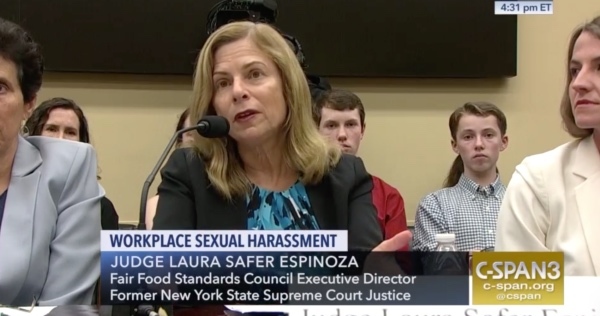 In seven states – from Florida to New Jersey – impacting 35,000 agricultural workers – the Fair Food Program has brought an end to impunity for sexual violence and other forms of sexual harassment on participating farms. Cases of sexual harassment by supervisors with physical contact of any kind have been virtually eliminated and workers consistently report dramatic reductions in all forms of harassment. How did this New Day come about? The answer lies in innovative, legally binding agreements achieved by the Coalition of Immokalee Workers, a human rights organization that is also the recipient of a Presidential Medal for its work against modern-day slavery. Excluded from many legislative protections, and facing lack of enforcement for those that do exist, Coalition members, supported by consumers of conscience, went to the top of the food supply chain for the market power needed to transform their workplaces. As a result, 14 major supermarkets, fast food restaurants and food service companies have committed to purchase only from growers that implement a Code of Conduct with zero tolerance provisions for sexual assault, forced labor and child labor, and a range of other protections, including the right to work free of sexual harassment and to raise complaints without retaliation. Compelled by this purchasing power, Participating Growers commit to implement the Code, and to cooperate with the Program’s monitoring organization. The Program works because its standards were generated by workers themselves – the true experts on human rights abuse in their workplace. It works because education on their rights is extensive and ongoing. And it works because informed workers are free to access the Program’s monitoring organization. Through comprehensive audits and a 24/7 complaint line, the FFSC ensures that violations are addressed in record time and free of retaliation. But most importantly, it works because of the Program’s prompt and effective market consequences for non-compliance. Faced with a choice between retaining supervisors who commit sexual harassment or continuing to sell to some of the world’s largest food retailers, Participating Growers have always made the right decision. In the Fair Food Program, the right moral choice is also the right business choice. And everyone benefits, as participating growers have become employers of choice and buyers eliminate supply chain risk. Now, workers in sectors as diverse as dairy in Vermont, janitorial work in California, poultry in Arkansas, and models in the fashion industry are adapting the Fair Food Program’s elements to their own circumstances. At the same time our hotline continues to receive heartbreaking calls from farmworkers outside the Program. The growing demand for FFP produce is driving much needed expansion and it is our hope that government procurement policies become part of that demand, to ensure that all farmworkers are as safe, secure and respected as those on FFP farms. Judge Safer Espinoza also submitted a longer form testimony for the hearing record, which you can read here. Perhaps the most encouraging aspect of the hearing occurred during the question and answer session following the prepared testimony (for those lovers of CSPAN, you can watch the two-hour long hearing in its entirety, including the Q&A, here). It was then that several of the members of the caucus expressed interest in supporting the Fair Food Program, including exploring the possibility of federal procurement policies that favor programs proven to curb sexual harassment and assault at work, like the FFP, with the promise of further discussion towards that end in the near future. The Fair Food Program welcomes the bipartisan Congressional Caucus for Women’s Issues’ support for real change in the lives of working women and interest in the efforts and success of the Fair Food Program in ending sexual violence in the fields. A visit by a delegation of Congressional representatives to the fields here in Florida where the Fair Food Program’s protections are in place would be a logical next step to understanding the FFP’s unique mechanisms and impact and putting the power of the US Congress behind its expansion.